Now that Hitachi has made the full transition to Metabo HPT, they’re rolling out the MultiVolt line as a sign of what’s to come. The Metabo HPT MultiVolt 10-inch miter saw is one of the more intriguing items we’re taking a look at first. If you’re wondering if this is really a Hitachi cordless miter saw, the answer is yes. It’s just getting the new Metabo HPT branding. The big highlight for this saw is its combination of cordless power with the ability to use an AC adapter. Better yet, that AC adapter will work on any Metabo HPT MultiVolt tool. Metabo HPT goes with a zero clearance rail system. What’s interesting is that it moves away from the typical rails directly over each other or to the side of each other. Instead, it gets more of a diagonal orientation. We’ll have to wait and see if that gives it more stability. 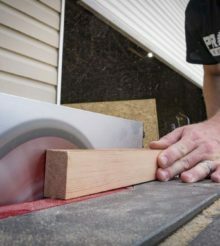 This is a dual bevel miter saw, so you’ll get both mitering and beveling to the left and right with respectable ranges. Pricing is interesting with this and several other Metabo HPT tools. Technically, they’re being sold as bare tools. But that’s a little misleading. When you pick up the saw, you’ll have a choice of an AC adapter or a battery/charger combo. Plus, if you register your tool online between November 1 and December 31, 2018, they’ll send you a free battery. That’s not bad for $619. By comparison, Milwaukee’s M18 Fuel 10-inch miter saw is $599 with no AC option and DeWalt’s FlexVolt is $63 – $799, depending on which kit you get. The FlexVolt is a 12-inch saw. I had a Hitachi miter saw once. It was pretty flimsy, and I was fortunate that it broke on the first project, well within the return window. Hopefully the name change and price difference signals a big change in the quality of their materials and workmanship.